As for the politicians who "use" his name, the last time I met him, together with others, on 10/09/1993, which was election day, he told us with indignation about politicians of the then two major political parties who exploited his name (of course he never recommended a politician for the people to vote for) to gain votes and how he supposedly "decorated" one of them when he met him. The above demonstrates the unethical use of some holy people and Mount Athos by "well-wishers". Figures like Fr. 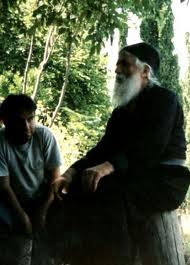 Paisios aimed towards the depth of the soul, towards that which remains and leads us to Christ and eternity, and not to the frivolous and transient. Let those who read such "prophecies" and recommendations be careful then, and not accept and propagate them so easily.